Ellman's Music Center offers music lessons for students at every level, on a full range of instruments. As a freelance Trombonist/Educator Luke Malewicz received his Bachelors degree in Music in Jazz Studies in 2006 from Indiana University in Performance Studies. He went on to earn his Masters degree in Jazz Arts from Manhattan School of Music in 2009. His teaching background encompasses guest lecturering at Indianna University and Columbia University. Luc Malewicz also offers private studio teaching in the Chicagoland area in theory, improvisation, composing/arranging, as well as teaching trombone to beginning college students. I enjoy listening to everything from classical, jazz, to popular music because you can find inspiration in all kinds of music. Visit Luke Malewicz's website. With a specialty teaching piano, Carrie Tedrahn is the director and owner of Early Notes Music Studio. She began teaching Kindermusik at Benedictine University in January 1997 when she opened the studio. She is an active percussionist performing with the St. John Brass Ensemble and various local orchestras on an as needed basis. She earned a Bachelor of Science degree from Elmhurst College and earned her MBA at Lewis Univeristy. In addition to her private studio classes and lessons, Carrie has taught Pre- K -2nd grade classroom music at St. John Lutheran School in Wheaton, IL. She has volunteered her time to work with School District 200's early childhood intervention program teaching the Kindermusik program in the late 1990's. Carrie is a member of the Early Childhood Music and Movement Association (ECMMA) and Music Teachers National Association (MTNA). Recently, Carrie has added playing organ for worship service in local Lutheran churches to her repertoire of skills. Her favorite music selections include Classical, Sacred, Jazz, and Pop. She loves variety and balance. Aaron has been teaching guitar lessons for over 15 years in the Chicago suburban area. His students range in age from 5 years old to adult and range in levels from beginner to professional. Aaron also has experience working with students with special needs. Aaron teaches several musical styles including: jazz, latin, blues and rock. Aaron also teaches techniques for solo guitar, duo, trio and big band. Aaron received a Bachelor in Arts degree (Jazz Guitar Performance) from Columbia College - Chicago. While attending Columbia College, he studied jazz guitar with Frank Dawson. He has also studied with John Papadolias and Don Tisch. Aaron is an active professional guitar player working with several groups throughout the Chicago area including performances at such notable venues as Andy's Jazz Club and the Jazz Showcase. Having begun playing the violin at the age of 5, Michael has literally been playing the violin nearly his entire life. He received a Bachelor of Arts degree in chemistry from St. Olaf College, where he was a member of the St. Olaf Orchestra. During his senior year of college, Michael performed as a soloist during the orchestra's fall tour. Recently Michael completed his Master of Music degree in Violin Performance from Northern Illinois University. While at NIU, he taught violin lessons through the NIU Community School of the Arts and performed with the Illinois Valley Symphony Orchestra and the Northern Illinois Chamber Orchestra. Michael is a 2 time winner of the NIU Chamber Ensemble Competition and currently plays with Camerata Chicago and the Antiqua Baroque Consort as well as subbing with the Fox Valley Orchestra. In addition to performing, Michael enjoys sharing his passion for music with young people. He is a registered Suzuki instructor and has experience working with students of all ages and ability levels. Ellman's Music Center is glad to have Michael as a member of our teaching staff! Sunica Markovic has 16 years of experience teaching piano in Europe, starting in 1987. Her favorite music is classical compositions. Read more about Sunica Markovic. Timothy Omerod began his musical career on the tenor saxophone. He received his B.M. degree in bassoon from Chicago Conservatory College in 1978, and his M.M. degree in bassoon from Northwestern Univrsity in 1979 .During his undegraduate tenure, Tim was listed in the Who's who in American Universities and Colleges. After college, he studied the clarinet, flute, sax, and oboe with professional players from the Chicago area. He has performed in a variety of venues, including principal bassoon with the Fox Valley Symphony, and sax/flute/clarinet/keyboards/vocals in top forty bands and shows, for clubs and hotels across the Midwest. His performances include Marriot Licolnshire shows, and Ray Charles last show in Chicago. Tim directed the College Jazz Ensemble at Lewis University, and is currently adjunct instructor of sax at the College of DuPage. Scott Dittmer has been teaching in Chicago and the Chicago suburbs for many years. 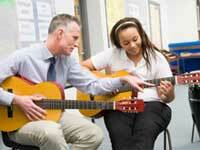 He teaches all levels of guitar to any age student. Scott has many years of live and studio playing experience. Mike has been teaching piano at Ellman's Music for several years. He earned BM - Theory and Composition and BM History and Literature degrees from Illinois State University in Normal, IL. Mike has been teaching private piano lessons since 1995. Mike is in demand and receives high praise from his students. Rob began his professional career serving with the United States 3rd Infantry Division Band in Wurzburg, Germany. He performed as both trumpet player and vocalist. After his tour of Europe was over, he studied music theory and education as well as trumpet performance at the University of Illinois. For the past 20+ years, Rob has been a performing professional musician in and around the Chicago area, sometimes playing as many as 20 dates a year. He currently manages and leads the band Soda, which performs at weddings, festivals, private events and clubs in the metro area. For trumpet instruction, Rob stresses the fundamentals of breathing, articulation and technique and works to help the student develop the proper interpretation of the stylistic elements of the jazz and classical repertoire. For guitar instruction, Rob presents a populist approach that looks to have the student learn and play current and classic songs within a very short time. Jered earned a BM in trumpet performance from Southern Illinois Univerisity in Carbondale and his Masters in trumpet performance from Roosevelt University. Jered performs with many symphonic and musical theater organizations throughout the Chicago area. Credits include Chicago Symphonic Winds, Chicago Composer's Orchestra, Porchlight Theater, Bailiwick Theater and Wunderbrass. Jered is a high-energy teacher who really gets the most out of his students.